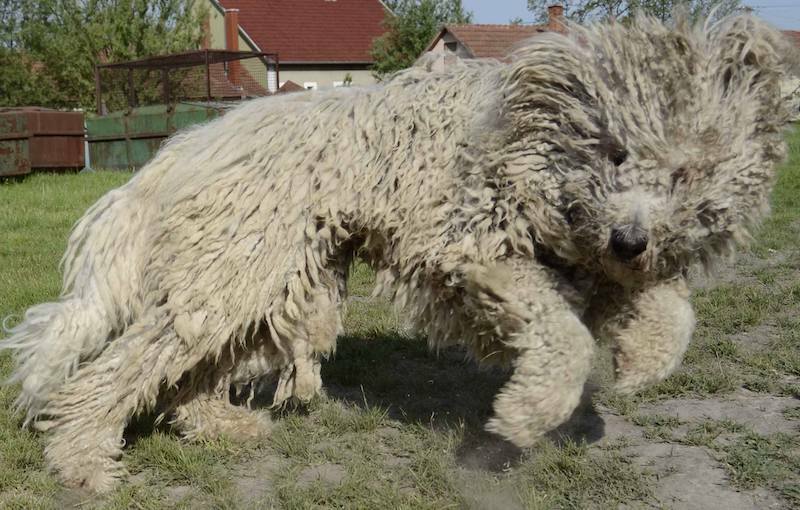 Komondor dog breed is characterized by imposing strength, courageous demeanor and pleasing conformation. 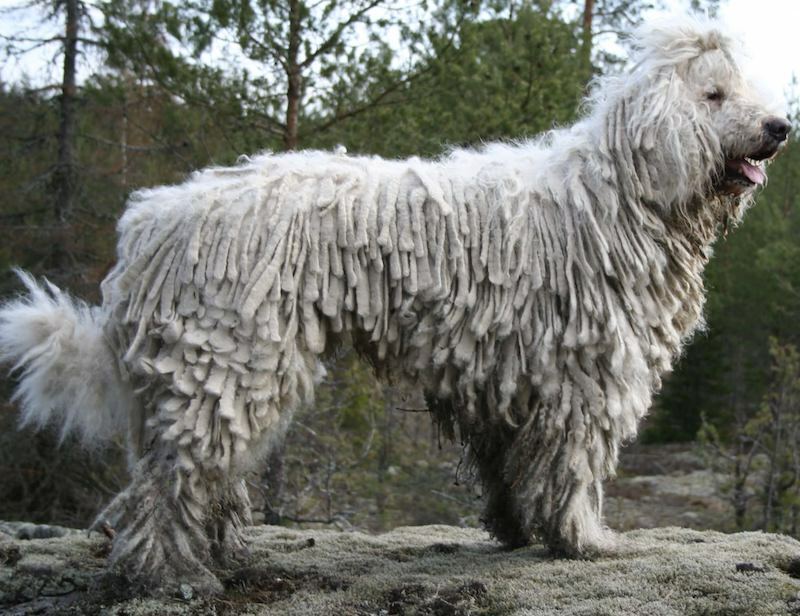 In general, the Komondor is a big muscular dog with plenty of bone and substance. 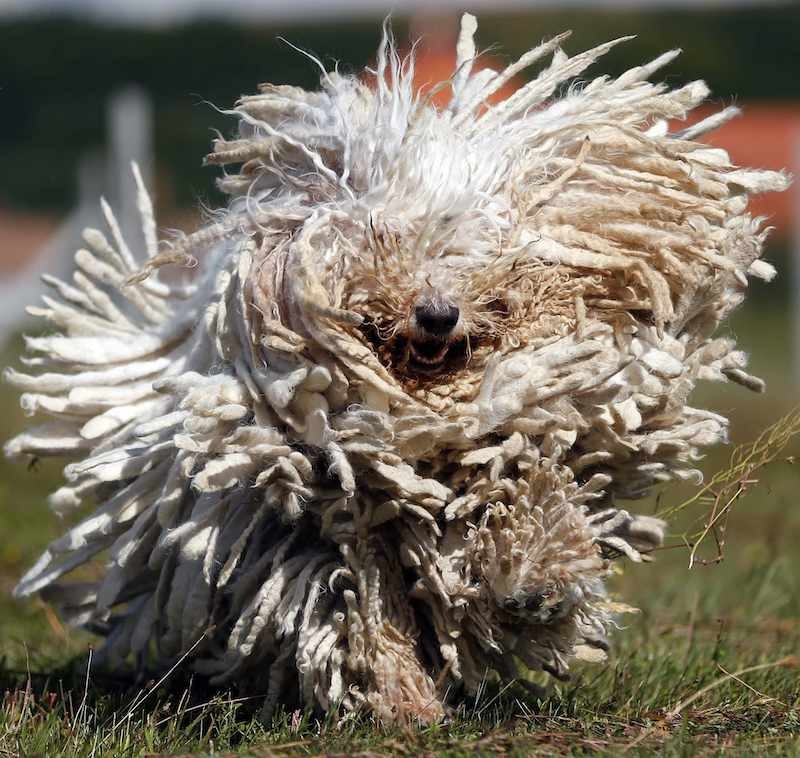 Komondor Temperament: As a house guard as well as a guardian of herds he is, when grown up, an earnest, courageous, and very faithful dog. The young dog, however, is just as playful as any other puppy. He is much devoted to his master and will defend him against attack by any stranger. On account of this trait he is not used for driving the herds, but only for guarding them. His special task is to protect the animals, and he lives during the greater part of the year in the open air without protection against strange dogs and all kinds of beasts of prey. Size: The height at the top of shoulders is 23-1/2 – 31- 1/2 inches (59-80 cm). 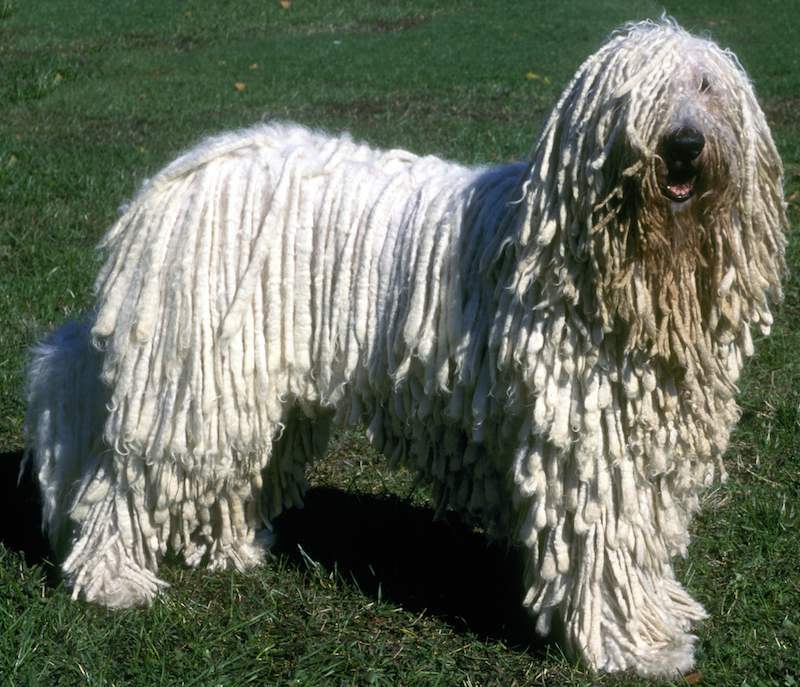 The bigger the Komondor, the better. A minimum height of 25 inches (63 cm) at top of shoulders for males and 23-1/2 inches (59 cm) for females is required. The body and the legs should form a rectangle. 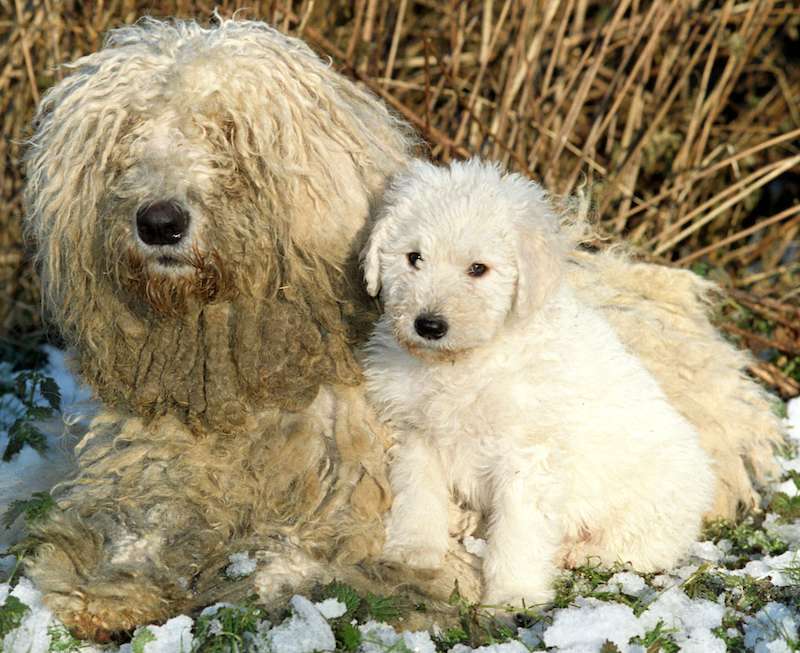 Coat and Colour: The entire body of the Komondor is covered with a long, soft, woolly, dense hair of different length on the different parts of the body, with inclination to entanglement and shagginess. If the dog is not taken care of, the hair becomes shaggy on the forelegs, chest, belly, rump and on the sides of the thigh and the tail. The longer and the more ragged, the better, though as above stated, the length of the hair varies on the different parts of the body. The longer hair begins on the head and ears and lengthens gradually on the body, being longest on the thighs and the tail. A somewhat shorter, but still long hair is found on the legs, the muzzle and the cheeks. Too curly hair is undesirable. The colour of the hair is white. Any other colour is disqualifying. 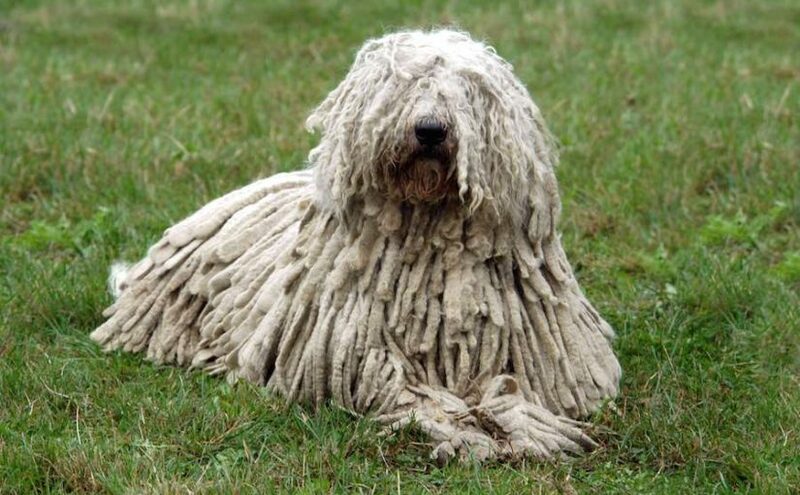 Head: The head of the Komondor is covered all over with long hair, and thus, the head looks somewhat short, in comparison to the seemingly wide forehead. When the hair is smoothed, it will be seen that the skull is somewhat arched if viewed from the side; the forehead is not wide, but appears, however, wider through the rich growth of hair. The stop is moderate, it is the starting point of the muzzle which is somewhat shorter than the length of the skull. The topline of the muzzle is straight and about parallel with the line of the top of the skull. The muzzle should be fairly square. In comparison to the length given in the head description, the muzzle is wide, coarse and not pointed. The lips cover the teeth closely and are black. The muzzle is mostly covered by long hair. The edges of the muzzle are black or steel blue-grey. The nostrils are wide. The colour of the nose is black. 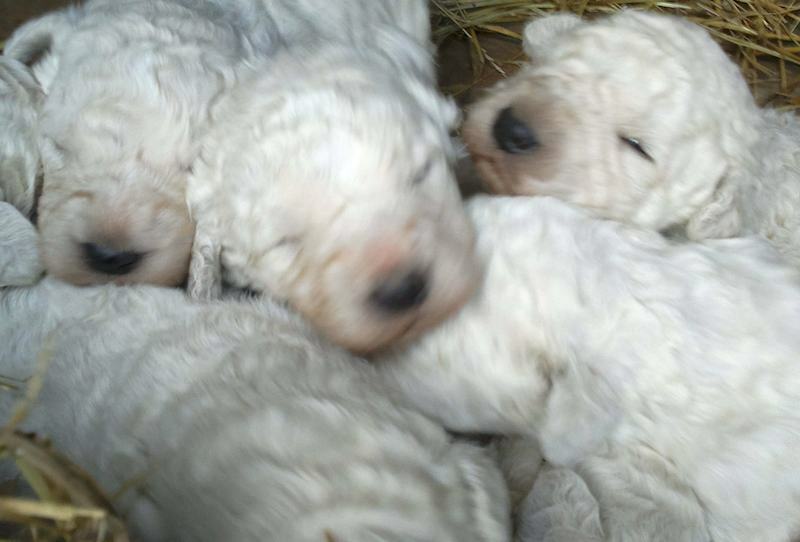 Komondors with flesh-coloured noses must absolutely be excluded from breeding. A slate-coloured or dark brown nose is undesirable but may, however, be accepted for breeding purposes. The jaws are powerful, and the teeth are level and close together evenly. The eyes express fidelity. They are medium sized and almond shaped, not too deeply set and surrounded by rough, unkept hair. The iris of the eyes is of a coffee or darker brown colour; a light colour is not desirable. Blue-white eyes are disqualifying. The edges of the eyelids are slate-grey. The ears are rather low-set and hang along the side of the head. They are medium sized, and their surface is covered with long hair. Neck: The neck is covered with long hair, is muscular, of medium length, moderately arched. The head erect. No dewlap is allowed. Forequarters: The shoulders slope into the neck without apparent protrusion. The forelegs should be straight, well boned and muscular. Viewed from any side, the legs are like vertical columns. The upper arm joins the body closely, without loose elbows. The legs are covered all around by long, evenly hanging hair. Body The body is moderately long and level. It is characterized chiefly by the powerful, deep chest which is muscular and proportionately wide. Back and loins are wide. The rump is wide, muscular, moderately sloping towards the root of the tail. The body should be somewhat drawn up at the rear, but not Greyhound-like. Hindquarters: The steely, strong bone structure is covered with highly developed muscles, and the legs are evenly covered with long hair, hanging down in matted clods. The legs should be straight, as viewed from the rear. Stifles well bent. Dewclaws may be removed. The feet should be strong, rather large and with close, well-arched toes. The hind feet are stronger, and all are covered with long hair. The nails are black or slategrey. The pads are hard, elastic and black. Tail: The tail is as a straight continuation of the rump-line, and reaches down to the hocks slightly curved upwards at its end. It is covered in its full length with long hair, which when the dog is at ease almost touches the ground. When the dog is excited the tail is raised up to the level of the back. The tail should not be docked. Komondors born with short tails must be excluded even for breeding purposes. Faults: Light or flesh-coloured nose, albino or blue eyes, highly set and small ears. Short, smooth hair on the head and legs, strongly curled tail, colour other than white. Disqualifications: Blue-white eyes; colour other than white.